Rushdy, Roger. "Cabbage". The Canadian Encyclopedia, 22 March 2015, Historica Canada. https://www.thecanadianencyclopedia.ca/en/article/cabbage. Accessed 20 April 2019. Cabbage (Brassica oleracea, Capitata Group) is a biennial vegetable of the Cruciferae family, which is usually grown as an annual. 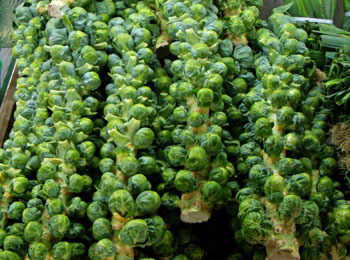 The cole crops (broccoli, cauliflower, brussels sprouts, etc) were developed from wild cabbage, native to southern and western Europe. Garden cabbage, the most universally grown cole crop, is popular because of its adaptability, hardy tolerance of low temperatures (young spring cabbage can tolerate temperatures as low as -10°C) and easy growing requirements. In temperate climates, a very large choice of strains enables cabbages to be grown year round. In Canada, however, summer cabbage is consumed immediately after harvesting; late cabbage, picked in autumn, can be stored for several months. Depending on the variety, cabbage heads may be round, flat or conical in shape; red, white or green in colour; and have smooth or wrinkled leaves (Savoy cabbage). 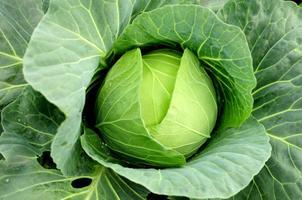 Cabbages may be grown from seed (maturing in 90-120 days) or as transplanted seedlings (maturing in 60-90 days). Although 90% water, cabbage is an excellent source of minerals and of vitamins A, B1, B2 and C. Canada produces around 180 000 t of cabbage annually; the main areas of cultivation are in Québec and Ontario.